Last month while I was away at QuiltCon, a special package arrived on my front porch: The Paper Pieced Home by Penny Layman. Publisher Interweave was kind enough to send me a copy to review, but being a huge fan of Penny and her designs and blog, I was planning on buying this book anyway. Penny is a major paper piecing expert. She designs patterns that you look at and think "how is that even possible???" And they are beyond cute. I wasn't surprised when I opened her new book and loved everything I saw. The Paper Pieced Home is 136 pages and comes with a CD of paper piecing templates. It begins by listing necessary tools/supplies and then gets into the basic steps of paper piecing these designs. This is super important (to me anyway) because these patterns have several different sections that are paper pieced and then stitched together to make your finished blocks. Penny also spends time covering fabric selection (she has SUCH a good eye for this) and more advanced techniques such as fussy cutting, sewing y-seams, and adding embellishments to your projects. How great is this fruit bowl on a grocery tote? Although if my groceries leaked onto this bag I would probably cry! Clawfoot tub bath mat! I want this tub in real life. 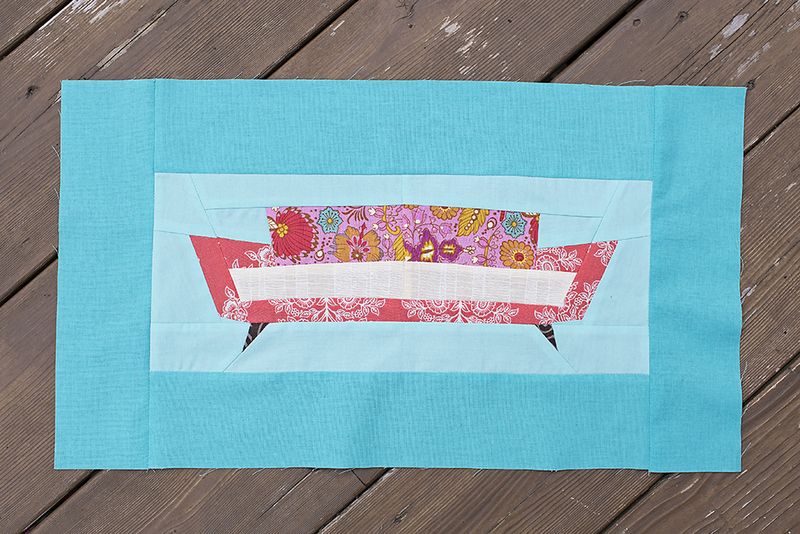 I actually made this retro couch block last week. I was so loopy with the flu that my fabric choices were absolutely horrific. I took the entire thing apart and fixed it. Which proves how delirious I actually was! I'm much happier with it now though. It's only a matter of time before I make this sewing machine for my sewing room. Penny's class at QuiltCon made this block. Amazing! You can buy The Paper Pieced Home on Amazon, directly from Interweave, or (hopefully) at your local quilt shop or bookstore! If you enjoy paper piecing (or learning new techniques) and making super cute blocks, this book is for you.